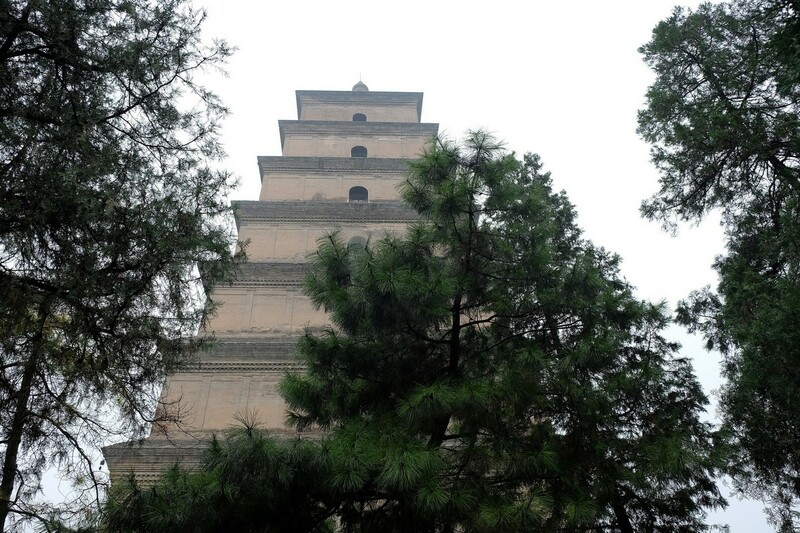 The pagoda was built in 652 in the Tang Dynasty. Additional stories were added on later but the pagoda suffered from a massive earthquake in 1556, reducing the number of stories to the present seven. It must be one of the tallest structures in the world when it was first built. An engineering feat and achievement at its time. Like the Pisa tower, it is leaning slightly to one side, although not as noticeable. Two years ago, I have a series known as The Impressions of Autumn. I don’t think I have showcased all the photos. This is a continuation of the series. The picture was taken in a temple on the Eastern side of Kyoto during Autumn. 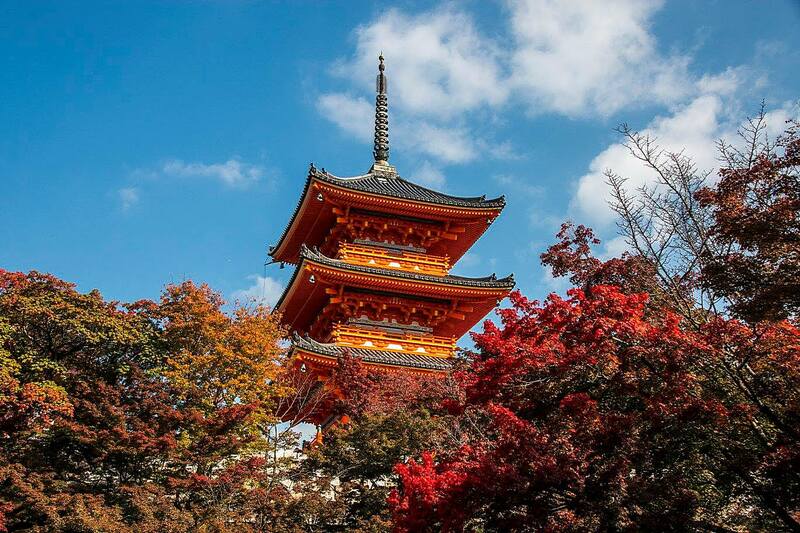 The pagoda rises gracefully above the color foliage. The picture was taken by my classmate YM Chan to which credit is due. 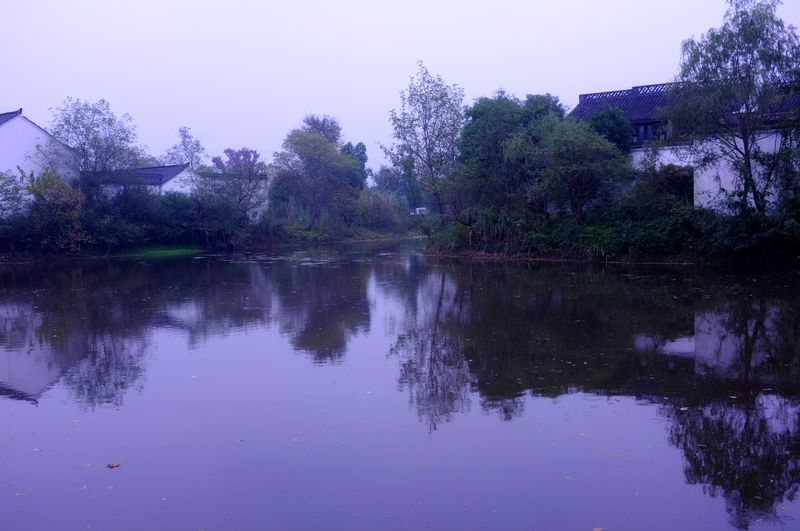 In the last two times I visited West Lake (Hangzhou), it was deep Autumn and rainy. So, my pictures all have a very bluish tint and didn’t look too interesting. 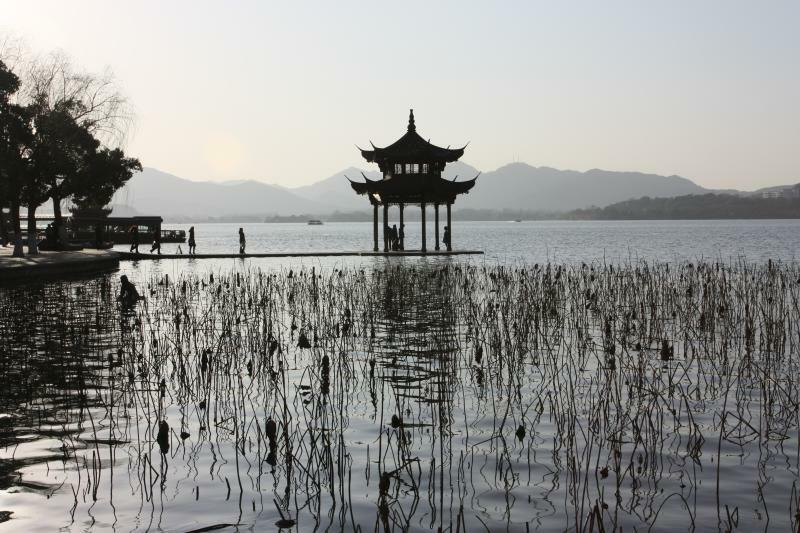 Here is a photo supplied by my friend CP Chan, showing the silhouette of a pagoda, in the water. 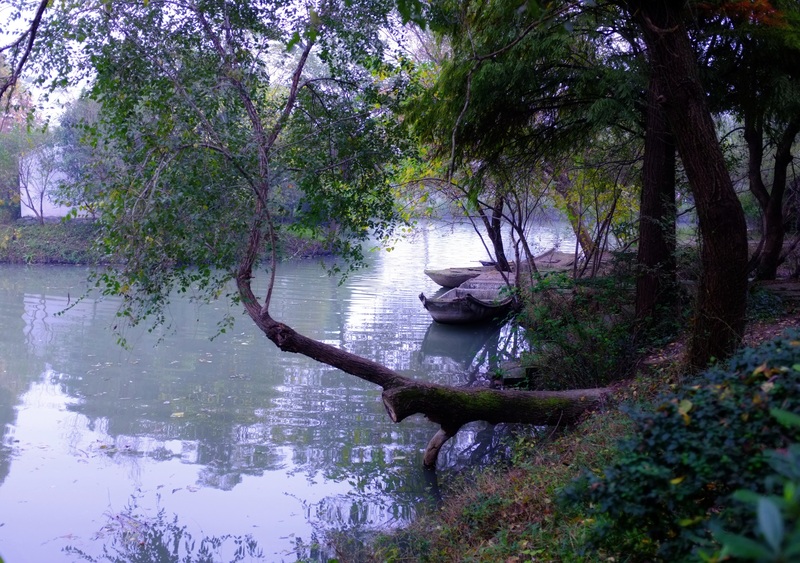 This image illustrates Hangzhou at its best, when everything seems to be an impression, rather than real. 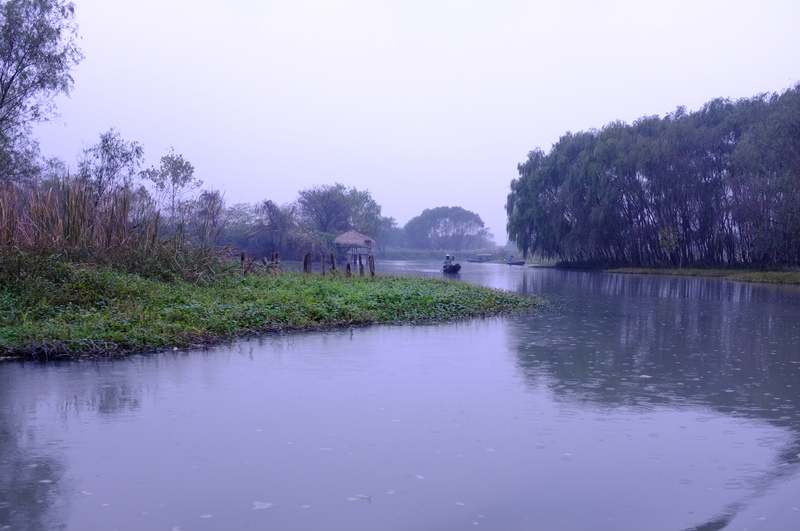 While we were in West Lake, we took the opportunity to visit Xixi, China’s only national wetland which is 5 km away from West Lake. 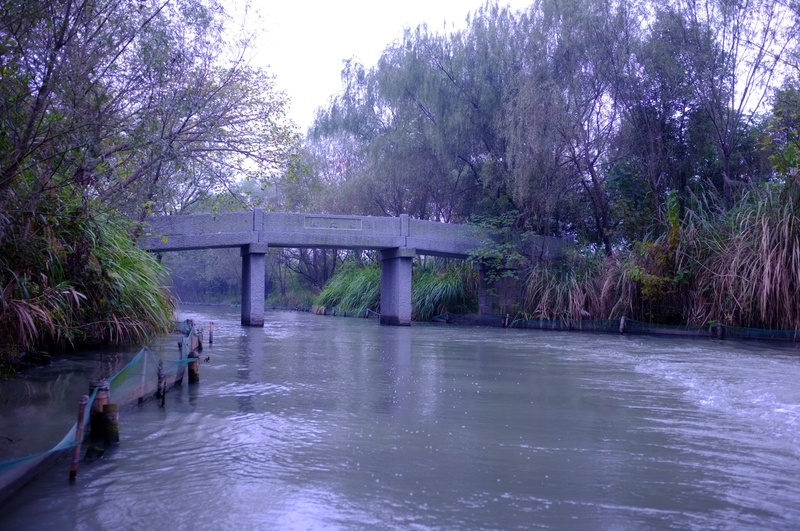 Xixi National Wetland Park covers approximately 10 sq km. 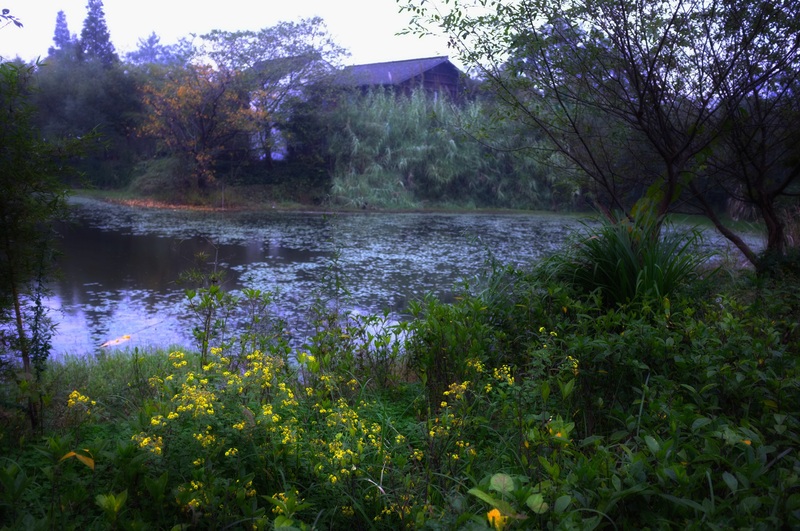 The wetland, which has a history of 1800 years, is a self-sustaining ecological system and is now an eco-educational center. It is also a paradise of various kinds of birds. Water is the soul of Xixi. it covers 70% of the park. 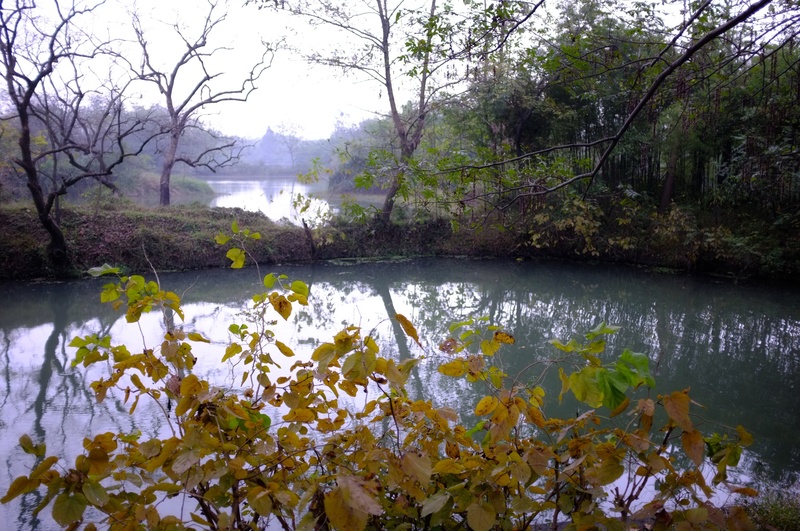 The park is crisscrossed with six main watercourses, scatter ponds, lakes and swamps. 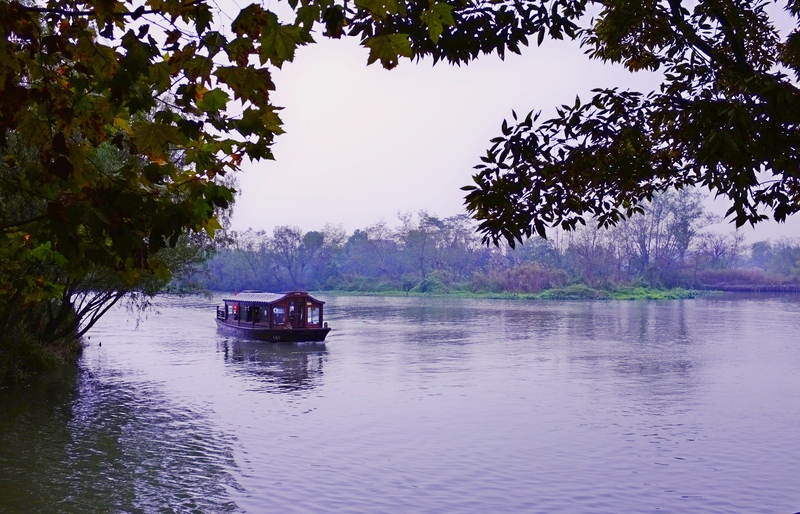 We took a boat which brought us along the waterways to various islands and sights. 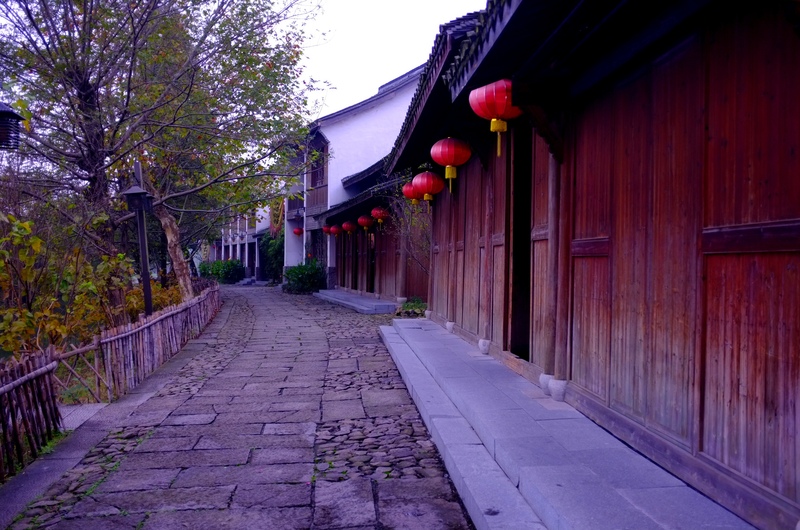 Xixi has long been a land of seclusion. 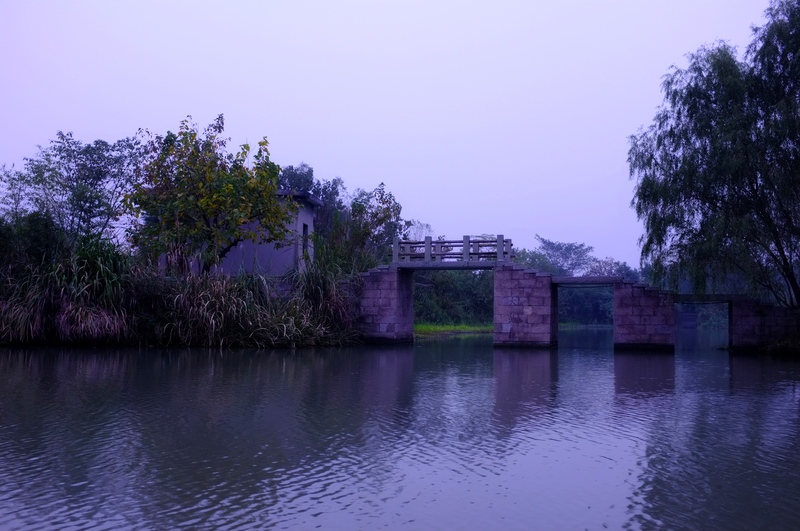 Thanks to the picturesque waterways and rural landscapes, Xixi has always been the home for artists and writers who produce poems, calligraphy, paintings and epigraphy. In some of the famous buildings here many scholars and poets have written their famous poems and prose. As it was winter, we found we were the only visitors in many of the scenic spots. On the boat, we passed through many beautiful sights. We first passed by this footbridge with three spans of different levels. Travelling further along the waterway, there was this other footbridge spanning across the lonely waterway. The boat brought us to various locations where we could jump off and walked the trails. We landed on one of the islands and passed by some deserted sampans. We lazily strolled along a dyke by the side of this ancient pagoda. The trail brought us to many lakes and more and more houses of ancient designs. When it was time for lunch, we have a simple lunch in this restaurant with red lanterns. Not surprisingly, we were the only guests in the restaurant. After lunch, we wandered further along the trail, visiting more houses. The weather was not forgiving. Like what we had the previous day at West Lake, it started raining again. We saw this lonely boatman rowing his sampan hurrying home. 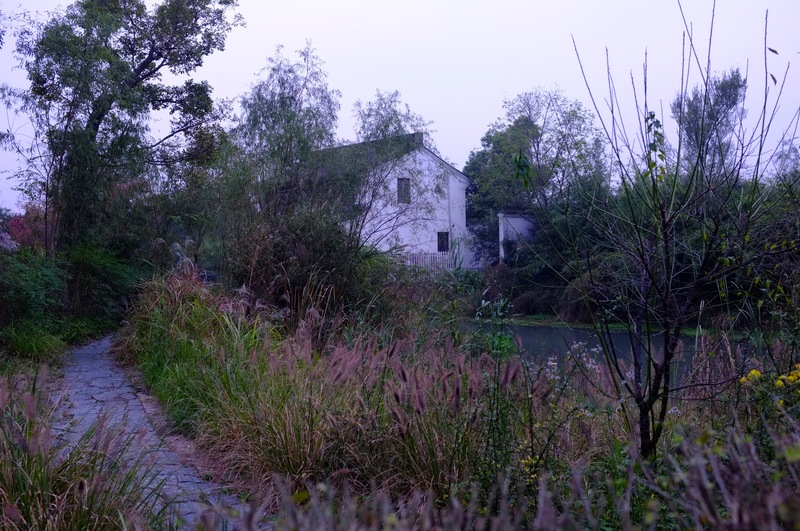 This reminded us that it was almost time that we should be making our way back to the hotel by the lake in West Lake. 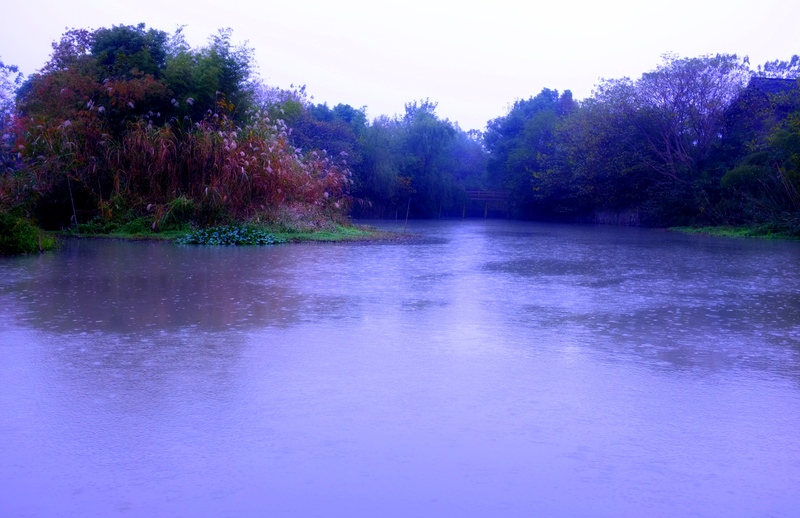 The rain kept pouring down, hitting hard at the reeds by the side of the waterway. Although it is a known bird paradise, no birds were in sight. 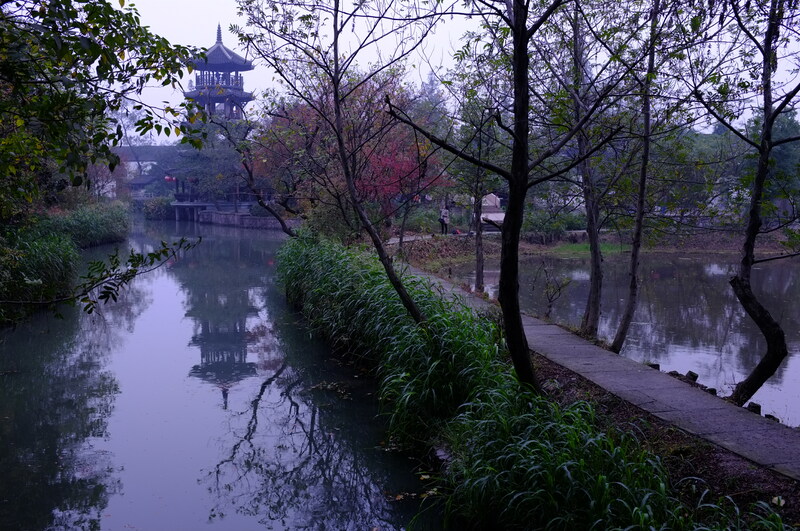 It is said that Xixi has several distinct aesthetic features: cold and secluded, raw and wild, simplicity and elegance. Throughout the whole trip, we were mindful of their presence. But our first impression of this park is indeed its grey and loneliness. With the grey sky above us and with loneliness in our hearts, we vowed we would come back and revisit it on a more cheerful day . . . . . . . . . .